Hi Tony, your webpart looks great. But how did you even get a Promoted Links list into a modern team site? Whenever I add a new app, promoted links is not an option. I’ve tried saving an existing promoted links list as a template so I can re-use it on a modern team site and link it to your web part, but again I don’t see my template within the apps list of my modern team site. Any info on how you created your list in the screenshot would be greatly appreciated. Sorry your comment got lost in the spam so I’ve only just seen it. Glad you got it sorted. 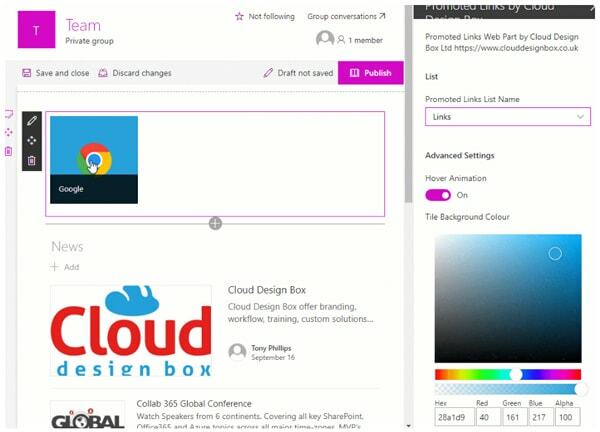 Yes, to get the promoted list template available in a team site would be to activate the collaboration lists feature.